Formerly called the Ellice Islands, Tuvalu is a Polynesian island nation situated in the Pacific Ocean, halfway between Australia and Hawaii; its closest neighbours are Samoa and Fiji. The nation is made up of four reef islands and five true atolls, coral islands completely encircling a lagoon. It is just 26 sq km and is the fourth smallest country in the world, larger only than the Vatican City, Monaco, and Nauru. Tuvalu is a peaceful island paradise, miles away from anywhere. But the reason you may have heard of it is not likely to be because of its undoubted charms, but because the island is under threat from disappearing under the ocean. If it's your lifetime wish to visit Tuvalu, you need to get here soon! Whatever the rights and wrongs of global warming, Tuvalu has beautiful tropical islands with palm trees, fabulous marine life, and everything you need to enjoy a peaceful holiday. The remoteness and limited nightlife make Tuvalu ideal for couples, and for anyone seeking a break from the rat race. Visitors to Tuvalu spend most of their time on the island of Funafuti, as it is the only land mass in the group with accommodations. The outer atolls can be visited by using one of the passenger boats that makes round-trip sailings every three or four weeks. There is no tourist accommodation on the outer atolls, but they make for amazing day trips. Because the traditional community system exists on Tuvalu as it has for centuries, you will see first-hand how each family 'owns' a task they perform for the entire community, including building, fishing, farming, defense, or home building. The family task is passed from generation to generation in the family. This way of life isn't a re-enactment for tourists, this is how they live every day, and you could take part if you're very lucky. Diving, snorkeling, and swimming in the spectacular marine environment is the order of the day, since you have access to a vast expanse of clear, unspoiled ocean and atolls, film-worthy lagoons and coral reefs, and tiny islands all provide a unique South Seas ambience. For hikers, there are fabulous mangrove areas, and a few atoll scrublands that provide nesting spots for tropical birds. Mostly you'll find pandanus and hearty ferns that can tolerate the salt and humidity here. You should try to find a game of te ano, which means 'the ball', and is similar to volleyball. The Philatelic Bureau is a rather surprising tourist attraction � because Tuvalu is a small nation and relatively new, it's stamps are highly collectible. 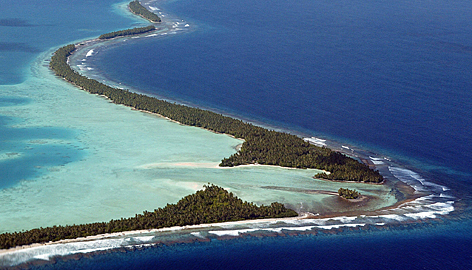 Much of the Funafuti atoll is protected, because of the threat over overfishing. Come here to see sea birds, turtles and a wide variety of colourful fish. Tuvalu was an American base during WW2 and reminders of the conflict remain, particularly plane wrecks. In the evening, you may be able to find a traditional dancing display � ask at your accommodation. Or, if that sounds like too much hard work, enjoy lazing on the beach and swimming. America stationed a large number of troops on Tuvalu during World War II, using the strategic location as a launch site to attack Japanese troops on nearby islands. Old runways exist on the north-eastern side of Nanumea and also on the islet of Motulalo in Nukufetau, along with the remains of World War II plane wrecks, for you to explore. Funafuti atoll was the main American base, and the remains of WW II artefacts are scattered over the main island of Fongafale. A very interesting, well-preserved bunker is dug into the islet of Tepuka; Tuvalu is a wonderful destination for history and war buffs. Funafuti is the capital of Tuvalu, which is where you're likely to base yourself. The best � and really only � way to get around Funafuti is to hire a motorbike. There is one hotel in Funafuti, which is also something of a centre for social life, and there are a number of guest houses and lodges. The MVs Nivaga II and Manu Folau, both government-owned cargo/passenger ships, travel to Suva, Fiji, every three months or so (the trip takes about four days). One-way fares are A$73/316 for deck/double cabin, with meals. Pacific Agencies (679-331 5444; info@pacship.com.fj) is the agent for the MV Nivaga II and Manu Folau in Suva. The Marine Services Office (20055; Government Offices) handles schedules and bookings in Funafuti. The cargo boat Nei Matagare makes trips roughly once a month between Tuvalu and Fiji. Williams & Goslings (679-331 2633) are its Suva agents. Tuvalu's small international airport is on Funafuti. Air Fiji (679-331 3666) flies from Suva to Funafuti (from F$1300 return) on Monday, Thursday and Sunday in a 25-seater Brasilia aircraft. Make sure you reconfirm, as seats are in high demand. Recently there was talk again about Air Pacific also starting to operate this route and extending the service north to Kiribati; check the website for up-to-date information. History: According to the evidence of linguists, who can work out how old a language is, and hence for how long people had been speaking it, the language of Tuvalu - and hence the settlement of the country - goes back about 2,000 years. The traditional stories and genealogies, however, mostly go back only about 300 years. It seems, therefore, that the story we have today came to us not from the earlier ancestors but from later arrivals in Tuvalu. It is generally believed that the earlier ancestors came mostly from Samoa, possibly by way of Tokelau, while others came from Tonga and Uvea (Wallis Island). These settlers were all Polynesians with the exception of Nui where many people are descendants of Micronesians from Kiribati. In 1986, off the northern shore of Nanumaga, scuba divers investigated a local legend of a "large house under the sea". They found and underwater cave more than 40 metres down the wall of the coral cliff. Inside the cave there was evidence of ancient human occupation more than 8,000 years ago, which is sharply at odds with the general view that the Pacific was settled just 4,000 years ago. Climatic evidence of a massive rise in the see level that began 18,000 years ago and stopped 4,000 years ago may have drowned most of the evidence of much earlier human migration to Tuvalu and other Pacific islands. There are three distinct linguistic areas in Tuvalu. The first area contains the islands of Nanumea, Niutao and Nanumaga. 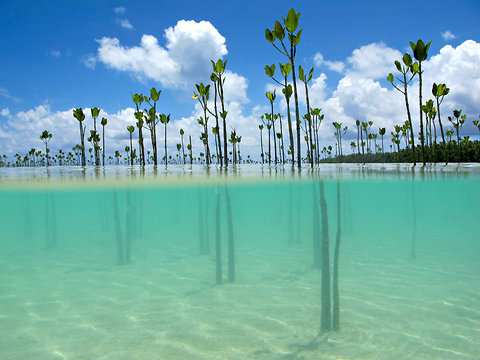 The second is the island of Nui where the inhabitants speak a language that is fundamentally derived from I-Kiribati. The third linguistic group comprises the islands of Vaitupu, Nukufetau, Funafuti and Nukulaelae. Today, Tuvaluan and English are both spoken throughout the islands. According to modern scholars the population of Tuvalu before 1900 was never more than 3000. These opinions are based on early missionary reports and on careful estimates of the population-supporting capacity of Tuvalu food resources. Although they may well be correct these views should not be accepted uncritically, for the written records come from people who were not intimately acquainted with life in Tuvalu. Moreover, there is always a danger that foreign commentators could impose a meaning of what they learned about Tuvalu which is quite different from those who live here. Weather: Hot, tropical climate with very little seasonal variation; average temperature 30 degrees Celsius; heavy rainfall, averaging approximately 353.5 centimetres per year; and, very occasionally subject to hurricanes - severe cyclones struck in 1894, 1972 and 1990. The wettest season is November to February. See the Tuvalu weather page for current up-to-date weather information and a satellite view.